The ZABAG "MAPO" gates are available with either a compact electro-mechanical drive with a 50 % duty rating for medium use or a heavy duty electro-mechanical drive with lever arms and 100 % duty rating for industrial applications. Swing gates can also effectively secure an entrance at a reasonable cost. 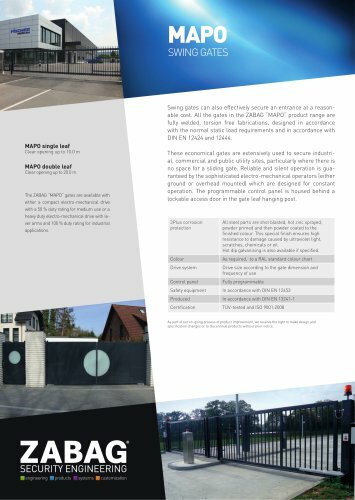 ALL the gates in the ZABAG "MAPO" product range are fully welded, torsion free fabrications, designed in accordance with the normal static Load requirements and in accordance with DIN EN 12424 and 12444. These economical gates are extensively used to secure industrial, commercial and public utility sites, particularly where there is no space for a sliding gate. Reliable and silent operation is guaranteed by the sophisticated eLectro-mechanicaL operators (either ground or overhead mounted) which are designed for constant operation. The programmabLe controL paneL is housed behind a LockabLe access door in the gate Leaf hanging post. As part of our on-going process of product improvement, we reserve the right to make design and specification changes or to discontinue products without prior notice.